i may find a photo for these words, but maybe not. it's cold outside, but not snow cold, just northeast texas december cold, brown and gray landscape, fallen leaves everywhere, dreary sky, gusts of wind that look like winter. sunday afternoon quiet on the almost-christmas streets of my neighborhood. the shadows are not yet dark, details not yet hidden. 3:40 pm. a friend stops by, we talk, then i return to this keyboard. at 4:16, the details begin to slip away. the morning of christmas eve. clear cloudless blue blue sky, but cold. christmas shopping done, packages wrapped. showed up early instead and is sitting, waiting for him, a surprise. it has been an uneasy season and i have the front door open despite the cold air. a fan blowing for me, the fire for the cat. my belly wants nothing more than for it all to be over, this christmas, this year, and it wants cold air. the uneasiness extends beyond me. across the street, behind the christmas lights, an argument has ended a relationship. he is gone and she is there, and never mind that she is right, i miss seeing him outside, smoking, calm. a man of untold stories. 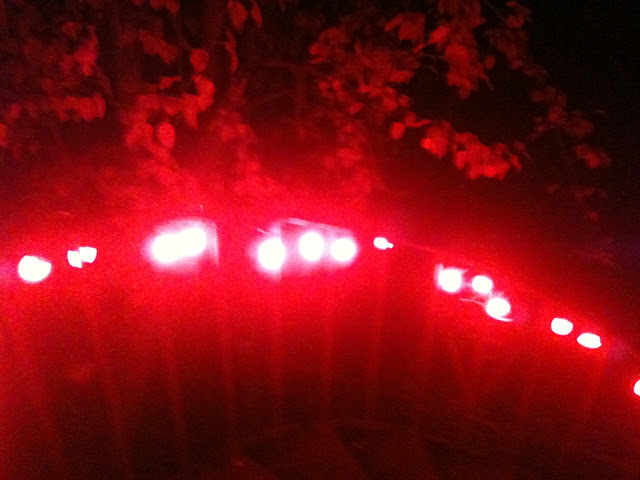 i sat with katie on the outside stairs, in the then warm air, in barefoot darkness under her red christmas lights, sheltered from the drizzles of on and off rain, and we talked while they shouted. later, i couldn't sleep. cold and sunshine and a gray sky going blue, slathered in white clouds. when i was a child, christmas morning meant the street was full of new bicycles and skates, new coats and thises and thats, full of us kids outside in whatever weather the world had given us. now the streets are silent, everyone inside, unless you count adults walking their dogs, a neighbor in her white robe, smoking a cigarette, another neighbor walking to her car, red bow in one hand, keys in the other. not a child yet to be seen and it is almost 10. back then, in my childhood, christmas was a mixture of santa and jesus, and no one worried about too much one or the other; it was christmas and that meant both presents and oh little town of bethlehem, and it meant tinsel on trees and wings on angels and no one lectured you if you believed, and if you didn't, you didn't lecture those who did. you sang along with christmas carols anyway, and did it with true joy. 'twas the season, after all.